There may not be a real Call of Duty game for mobile devices, but that doesn't mean there aren't some pretty good alternatives. In this post, we'll bring some of the better ones to your attention. All of the titles you'll see below share the following characteristics: they all let you control your character from first-person perspective, and they all try to immerse you in their own, unique atmosphere, although, in fact, they are simply throwing waves of enemies your way - enemies that are just begging to be taken down (or blasted to bits). If this sounds like your kind of thing, then what are you waiting for? Browse through the gallery below and enjoy these fun (and rather violent) CoD-like titles! 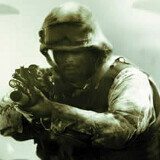 If you are on the lookout for a Modern Warfare-like game for Android, this is as close as you can get. Gameloft has clearly been inspired by Infinity Ward's ultra-popular franchise, and has developed a game with a dangerously similar concept. The second installment in the Modern Combat series is also worth your attention. With slightly inferior graphics, Modern Combat 2 is almost as CoD-like as its successor. The purpose of this game is to resemble Counter-Strike, which makes it very similar to Call of Duty, we guess. If you are a diehard fan of shooters like CoD or CS, you should definitely try Critical Strike Portable. If you'd like to immerse yourself in the WWII atmosphere of the CoD games, Brothers in Arms 2 will offer you just that. The game also supports multiplayer, which is a must for any self-respecting FPS. OK, this one's probably more of a Halo/Crysis clone, but someone's got to take care of the bad guys in the future, right? Besides, you still control your character from the first-person perspective, and blast your enemies with fancy weapons... how different could it be from CoD? N.O.V.A. 3 and the Modern Combat 3: Fallen Nation are the BEST! I don't know if you can do this (If this can be done already, my apologies), but it would be great if you can send the image from your smartphone to a Smart-TV and have your smartphone as a controller while you watch the TV screen. For me, playing these type of games in a cellphone after a while gets uncomfortable. Oh, it sure does. Very painful for the eyes and neck! Thanks!! I haven't seen this before, just went to youtube and watched how it worked. I have a GS2 and wasn't sure if it could handle wireless controllers (somehow I knew the TV screen display could be achieved but didn't knew exactly how). Thanks a lot guys! Modern Combat 3: Fallen Nation (Multiplayer) is the best. BEST PLAYED in the XPERIA PLAY..